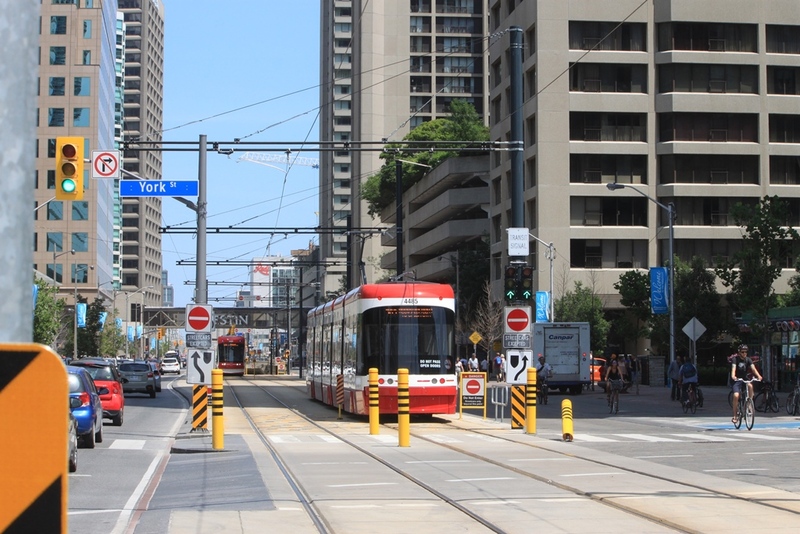 Since I published Part I of this review of the TTC’s July 10 Board Meeting, I have been remiss in finishing Part II which deals with various issues beyond system capacity planning. Ongoing details of the TTC’s financial situation have been split off from the CEO’s Report into a separate report so that they can be given the space needed to delve into this topic. This also simplifies reporting to City Council with a format that aligns with other City departments. The Operating Budget projection shows a fall both in projected expenditures and revenues from the original allocation. Expenses are projected to come in $18.5 million below the planned level, and this is offset by a corresponding reduction in revenue. However, most of that revenue reduction is not fares, but rather the TTC will not draw $14.0 million as planned from its stabilization reserve. Only $4.5 million of the revenue reduction comes from fares. In other words, the primary function of the expense cuts is to avoid the reserve draw leaving it available as one-time revenue to be included in a future budget. Wheel-Trans will underspend by $8.4 million which is partly offset by lower revenue to give a net saving (from the City’s point of view) of $7.5 million. 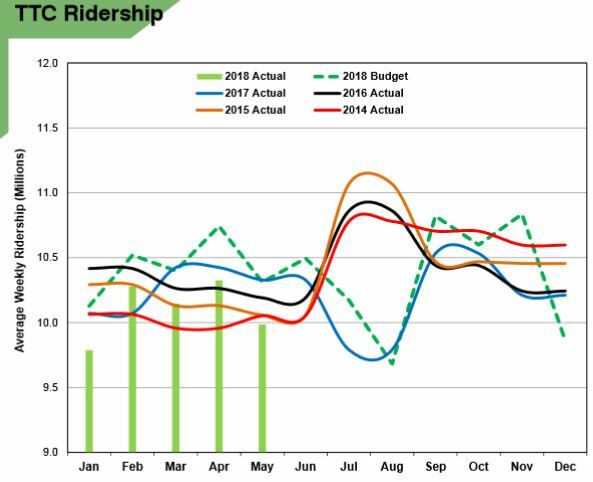 Ridership is down from the budgeted level, although this drop is expected to reduce in magnitude later in 2018. Over 75% of the expected shortfall is shown in the first 5 months of 2018 with only 1.6 million of the projected 8.4 million drop to appear over the remaining 7 months. The revenue situation is not quite as dire because the average fare is better than expected as riders migrate from Metropass to other fare media (see more about this later in the article). Although ridership is 1.6% below budget, the revenue from fares will only be 0.5% below budget. Although the price of diesel fuel is higher than expected, this is more than offset in savings on electric power (see details in the second table below). Labour costs will be higher than budgeted in 2018 because the TTC must adapt to more stringent work arrangements and shift some work formerly performed at overtime rates to new full-time staff with their associated overhead costs. The TTC will add 184 employees to its conventional work force and 25 to Wheel-Trans to handle the new rules. This increase goes to Council at its last meeting before the election, but should easily be approved seeing that the cost in 2018 will be absorbed within the approved budget. It is worth noting that higher labour costs are offset by reduced employee benefits expenses. This is due in part to the ongoing pursuit of fraudulent claims which has driven down benefits costs from the level originally anticipated. This offset will not necessarily continue once claims stabilize at a new lower rate. Savings in “Other Corporate Costs” arise from the slow transition to Presto. Fares that the TTC collects itself do not attract a Presto service charge and therefore the TTC is paying out less than it would have if the conversion were closer to completion. However, buried in “Departmental Labour” is the cost of the continued operation of the TTC’s own revenue processing functions. TTC “ridership” is a statistic that has brought much hand-wringing to Board meetings over recent years because the number has been falling. 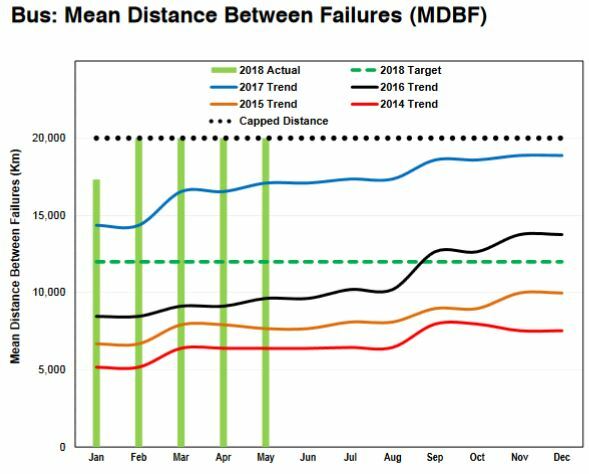 2017 was budgeted with a stronger target than the TTC actually achieved, and the same appears to be happening in 2018. This creates a situation where the TTC can begin the year talking about growth and new services, but in practice these do not all see the light of day. With 2018 being an election year, some improvements (notably the beginning of the Express Bus Network roll out) will show up, but even this must be seen in the context of shuffling resources among routes rather than net additions to service. When the fall schedule details come out, we will see just how much of this represents truly “new” service. Using existing buses more effectively is not a “bad” thing, but politicians may claim more of a net improvement than actually appears. The ridership numbers are strongly affected by Metropass sales. Ridership has flat-lined since 2014 due to various factors, including city growth and congestion, changes in customer mobility, and the growth of digital ride-hailing services. The TTC regularly surveys Metropass users to determine how many trips they take per month. The average value is used to convert Metropass sales to “rides”. Some pass users take a lot of trips and a Metropass is an obvious choice for them (I myself took 27 trips in the second week of July). For others the cost advantage is borderline and convenience leads to purchase of a pass rather than tokens. This convenience is also available with a Presto card, and riders will only have to pay for what they actually use. Moreover, it is far from clear that Presto is accurately calculating and billing for “trips” using the TTC’s transfer rules. Because a “lost” Metropass sale probably counts as more “trips” than the riders shifting to Presto actually took, “ridership” falls even though riders continue to experience packed vehicles. When the time-based fare comes into effect at the end of August, and one “fare” buys, in effect, a two-hour pass for Presto users, there will be a further incentive to shift from Metropasses to Presto for users whose riding pattern is borderline for the cost effectiveness of a pass. This will continue to widen the gap between “fares” and “trips” by removing the concept of a single, transfer-rule-based “trip” except for the remaining users of cash, tokens and concession tickets. By the end of 2019 when tickets and tokens are discontinued, the split between fares and trips will be almost complete. This will bring problems in looking at TTC usage stats because the conventional “ridership” value which is built up from sales of various fare media will no longer make sense. How the TTC will make this transition remains to be seen. For a detailed view of Presto migration plans, see Presto Update and Transition Overview from the June 2018 agenda. New fare gates have been installed across the rapid transit system with only two sites (King Commerce Court and Yorkdale main entrance) remaining. These will be completed as part of pending construction projects. Software updates and replacement of motors in existing gates are claimed to have greatly improved their performance, although users of some stations might beg to differ. There is no way to tell from external appearance whether a station’s equipment has been updated and whether devices that fail regularly simply await updates or continue to have problems. Average “availability” for May 2018 is claimed to be 96.86%, but there is no information on how this value is calculated. Deemed a policy change and is subject to Board approval prior to launch. Day Passes would be discontinued and replaced by 1-day PRESTO Tickets. In addition, a Daily Max feature will be introduced, which puts a cap on the maximum amount e-Purse customers will be charged per day. Release date for 2-ride, 1-day, and convention/special event PRESTO Ticket options is still being determined in collaboration with Metrolinx. Although the full launch of single-ride PRESTO Tickets will be in June 2019, the software functionality required for this product will be delivered by Metrolinx in February 2019. The contingency time buffer between the availability and full launch is put in place to conduct field trials. The Presto Update report gives an implementation date for the Day Pass on Presto as October 15, 2018 [p. 22]. At that date, only Daily Capping could be enabled as Presto will not yet support a 1-day LUM. The report is silent on the provision of a Group Pass for multiple riders on weekends and holidays, and does not even mention that it exists today, let alone how it would be replaced. Whether weekly capping will be part of the 2019 Budget and fare structure remains to be seen. Normally, this sort of change would be part of the pre-budget announcements pitched for political advantage, but with an election in progress this can only be part of a platform, not a firm commitment. The planned date for the end of Weekly passes is March 2019 [p. 40]. Presto ridership has grown slowly as riders migrate to the new fare card. The TTC expects the proportion of trips on Presto to grow substantially through fall 2018 as pass holders migrate to this medium and the two-hour fare makes Presto an attractive alternative to tokens and tickets. This will substantially increase weekly Presto rides from about 2.5 million to over 9 million, and will prove whether the Presto infrastructure can actually handle a much larger usage rate. To put that 57,000 in perspective, it is well below reported riding on the 504 King streetcar which receives considerably less service than the new subway. Whenever York University returns to full operation, it will be interesting to see how this number shifts. Another issue here is the question of through riding by 905-based riders bound for York U. Although the original intent was for YRT riders to take the subway south to York U at no added cost, this was not actually implemented, and parallel service still operate from the 905 into the university campus. This is an abject failure of “regional planning” and “fare integration”. The situation may improve if the cross-border fare discounts proposed by the Wynne government are actually implemented by the Ford regime, but their status is uncertain. The evolution of the complexity of Scarborough Centre Station on the SSE requires more design work than was originally budgeted to allow design work to proceed to the level needed for Council review in 2019. Oddly enough, there is a “slush fund” available to pay for this in that the design contract for Sheppard East Station is underspent now that this station is no longer part of the project. $26 million originally allocated to the Sheppard East design work has been transferred to the STC design which is underway by the same consultant, AECOM. It is ironic that the amount of the transfer out of one design project exactly matches the transfer in to the other. In fact, there is still more money stashed away in that Sheppard East contract allocation. Even after $26 million is shifted to the STC design contract, there remains almost $36 million unspent on the Sheppard East contract which would be used to cover overruns elsewhere in this project. 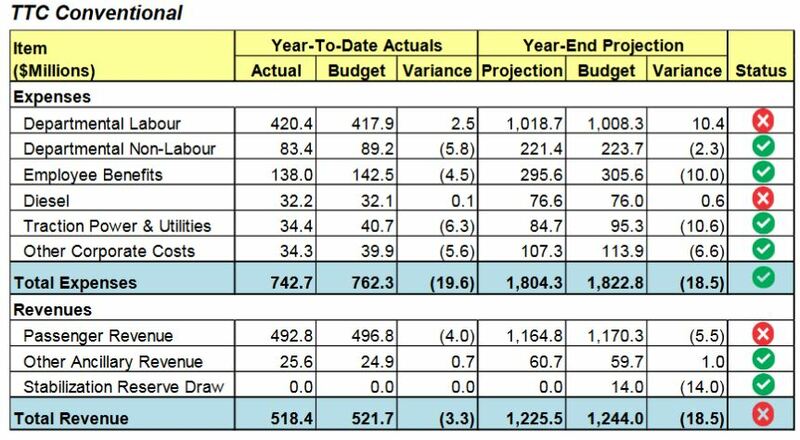 This sort of budgetary shuffle is not unusual in big capital projects, but it is strange that a large amount has been sitting unreported and not included in calculations of the net cost of the revised SSE project. 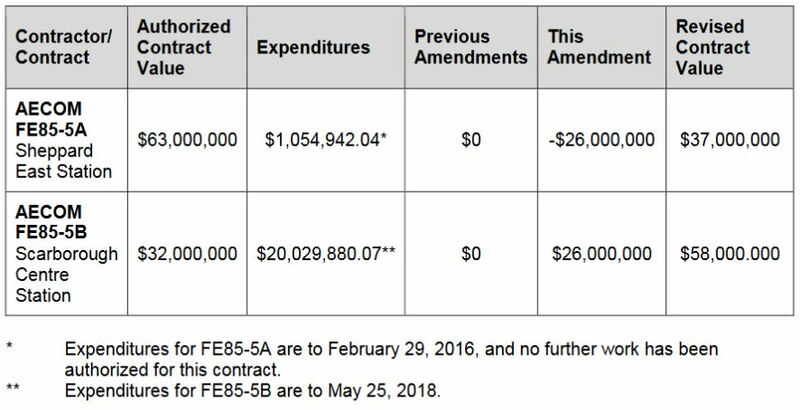 In effect, the TTC had $62 million that could have been netted out in the overall SSE project cost estimate. Of course, had they proceeded this way, then an overrun on any component would have triggered the need to ask for more design funds. Better to keep this spare change “under the mattress”. How many other contracts for the SSE design work have unused allocations just waiting to be plucked to cover overruns? After a series of incidents with wayward motorists driving into the streetcar tunnel at Bay and Queens Quay, various countermeasures have been attempted. These including warning paint strips, signs, rumble strips cut into the concrete and, most recently, pylons marking the do-not-enter zone (see photo below). Sometime this summer, a gate will be installed to further deter motorists. There are a few points worth noting here. In the photo, note how faded and the yellow hash marks are. This is not exactly high visibility at mid-day, and would be even worse at night when the incursions are much more common. The area is confusing to motorists because there are two separate eastbound lanes. One is the “standard” lane (for Queens Quay) to the north (left in the photo) of the tracks, and the other is on the south side of the tracks. This is a service lane providing access to the buildings on the south side of Queens Quay. Somehow, they manage to miss both of these and drive into the streetcar tunnel, in some cases quite a long way. This begs the question of whether they are competent to have a motor vehicle. The TTC has retained a consultant to review the Queens Quay design specifically regarding the centre vs side of road LRT reservation for the proposed extension into East Bayfront and beyond. They have never liked the side reservation layout, and appear to be working to push their right-of-way back into the middle of the road. This would require a complete redesign of Queens Quay East not to mention the bridges planned for the crossings of the Don River which are all based on side-of-road running. At Waterfront Toronto, the recent departure of CEO Will Fleissig could bring an end to the folly of a proposed “funicular” link replacing the streetcars in the Bay Street tunnel. I recently learned that this was his brainchild and with luck the scheme has departed with him. Toronto can now get on with planning and funding the much-needed Waterfront East expansion. Unfortunately, it is not on Mayor Tory’s priority list for his re-election campaign. Statistics for May 2018 continue a pattern seen earlier this year. Although TTC management often point to unusual events as the reason behind the numbers, it is clear that both the number of delays and the amount of time consumed by them are up consistently over earlier years. 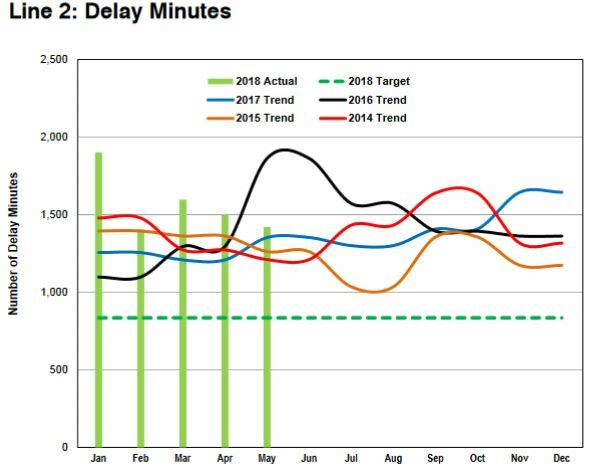 Passenger-related delays account for almost half of the total minutes reported, but the presentation of aggregate data does not allow readers to see progress on individual types of problems or the time taken to clear them. 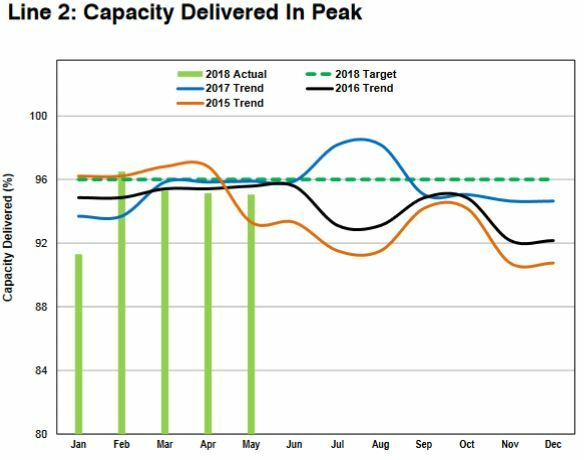 While the delay charts report all-day stats, the peak period service capacity is not looking good either. The TTC is consistently unable to deliver the level of service that it schedules. 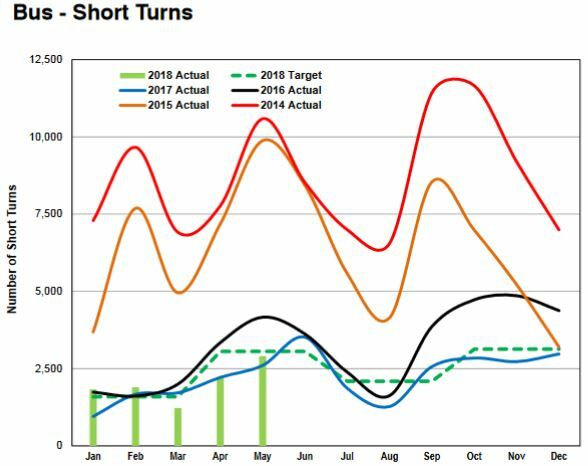 The chart reports monthly averages for the peak period, but not the maximum-minimum ranges, nor is there any sense of by how much the TTC “misses the target” and how often this happens. These charts are not “good news”. 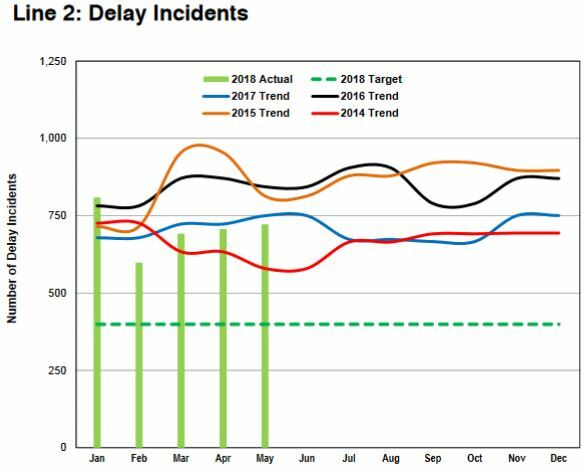 The situation on Line 2 is better than on Line 1, at least in terms of capacity delivery, but delay incidents and minutes sit stubbornly at levels comparable to previous years. As with Line 1 stats, the lack of a breakdown prevents us from knowing whether there is a change in the overall mix of delays, particularly whether those that are preventable are declining only to be replaced by other causes beyond the TTC’s control. Line 3 is beset primarily by problems with vehicle and infrastructure reliability. The fleet will not be completely renewed until late 2020, and so problems with the aging trains will continue to affect performance numbers. Capacity cannot be increased until all trains are back in service. 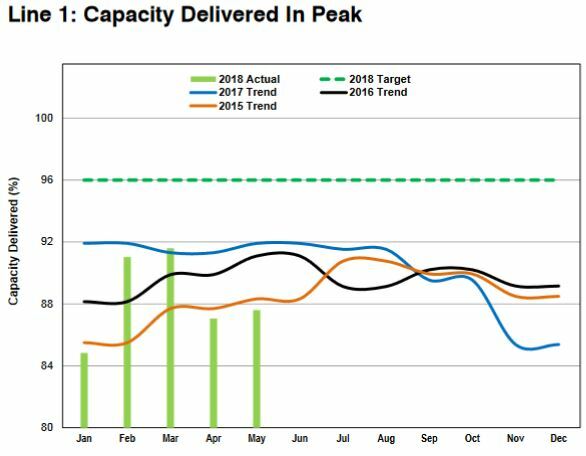 Peak capacity delivery stats have stayed over 96% since February 2018, but it must be remembered that this is relative to scheduled capacity. With the data framed as a percentage, not as an absolute value, the decline in line capacity due to train availability and enforced slowdowns is not seen. 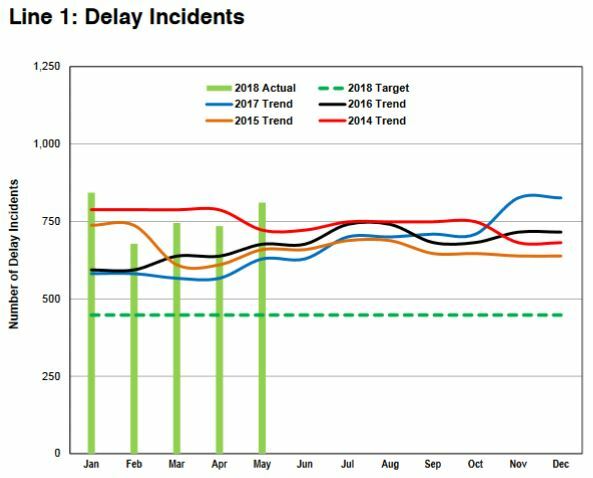 Delay incidents are running above the target level, but are slightly improved versus 2017. The report notes that there was a jump in “infrastructure” issues in May, the majority of which related to signals. Considering the relative youth of this line, that is a troubling statistic. 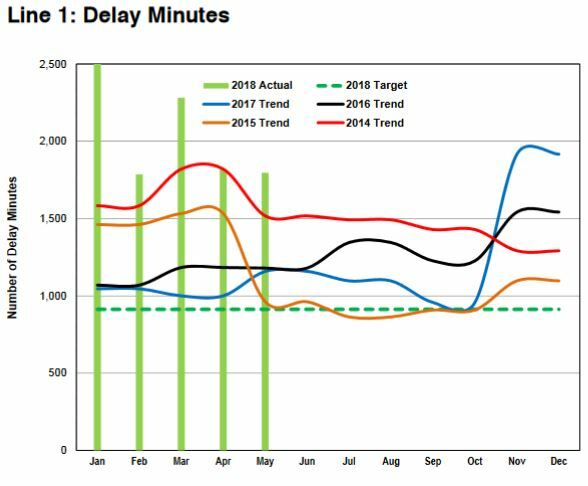 110 minutes, or 50% of all delay minutes that occurred in May were related to infrastructure, with 59 minutes in signal delays and 61 minutes in track delays. This is unusual for this line, where infrastructure delays are typically low. This begs the question of whether there has been a change in maintenance procedures that brought on a decline in reliability. We normally hear about a seasonal drop in the winter due to vehicle reliability problems, but not why the summer should also see a reduction. 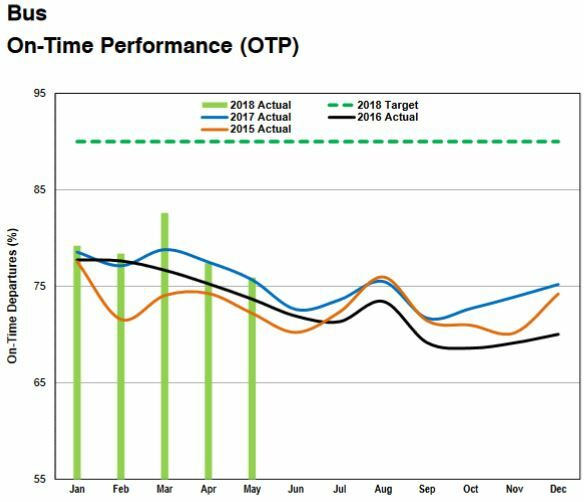 Indeed, the chart below implies that the winter is not a bad time for streetcar on time performance compared with the summer. The difference, of course, is that there is more traffic and events that can throw the downtown routes off schedule during the summer months. A work plan has been presented to TTC Executives and upcoming schedule changes to numerous routes leading up to the September Board Period. Further, a bus and streetcar Performance Management Group (PMG) has been established and will focus on improving and sustaining high on-time performance. When headways are short, as they are on streetcar lines most of the time, the allowable range is comparable to a headway, and service can depart bunched while still being “on time”. There is no measurement of headway reliability, only “on time performance”, and so convenience, as a would-be rider would see it, is not measured at all. Indeed, it is possible that if headways were at issue, and only gaps/bunches counted against “good” service, the metrics could look better than what is reported. Riders do not care if streetcars are “on time”, only that they show up regularly and reliably. There is no measurement of service quality anywhere on routes other than terminals, although most riders do not board at the ends of lines. The Performance Management Group would do well to reconsider just what they are measuring and reporting so that the numbers are more relevant to operations as seen by riders. 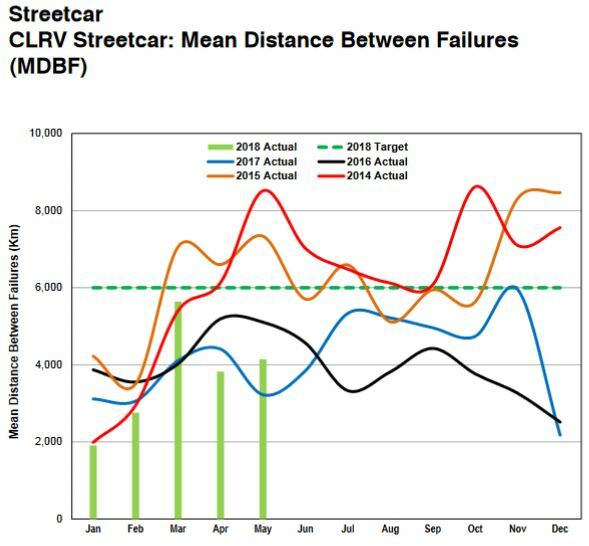 Streetcar short turns are running at a level comparable to 2017 and one must wonder whether the system has reached a plateau for improvements on this metric. 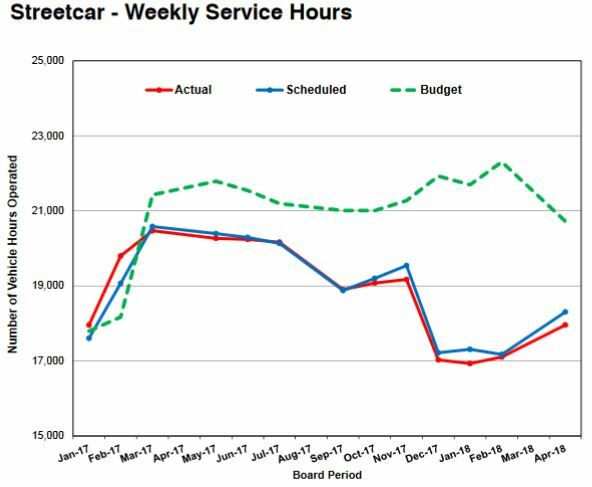 The weekly service hours for streetcars are running well below the budgeted level because of the decision to convert major routes to bus operation due to construction and a shortage of working vehicles. This started in 2017 and has accelerated in 2018 making one wonder why the budget is reported at a level that clearly it was never intended to provide. On-time performance for buses is tracking similarly to past years and, despite a high target, shows no sign of improvement. Again there is the issue of just what riders experience and the relevance of schedule-based rather than headway-based tracking and reporting. Schedule adherence is important for infrequent services where riders would plan to “meet” a bus, but for frequent routes, regular spacing is more important. In analyses that will be published over the summer, I will review several major suburban bus routes. Something that shows up quite consistently is that even when departures at terminals are well-spaced (i.e. little variation in headway from one bus to the next), this condition quickly deteriorates on some routes with buses forming into bunches long before they reach their terminals. A further problem exists on branching routes where there is no regulation of merging services to ensure even spacing. A good OTP score at terminals does not reflect the service most riders actually experience. 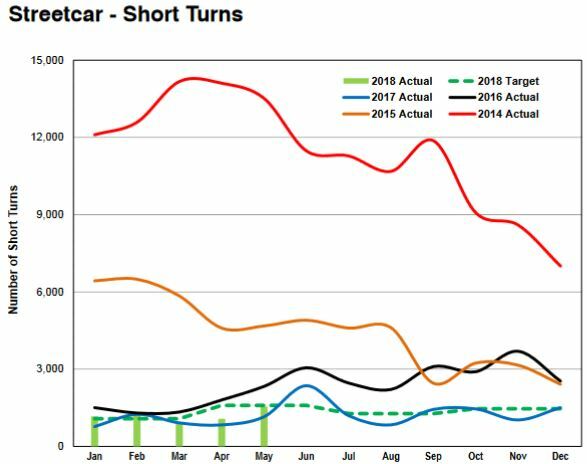 As with the streetcar network, the bus short turn stats appear to have settled into a pattern over the past two years. Service hours for buses are running well below scheduled levels. This is claimed to be due to the streetcar shortage, but that runs headlong into the claim under streetcars (above) that the shortfall there is caused by bus replacements. 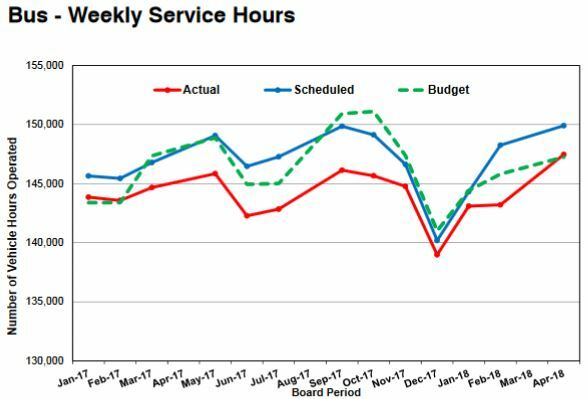 Both modes are running below their budgeted levels, and what is likely happening here reflects the decision not to operate as much service in 2018 as originally planned due to the decline in ridership overall. At some point, the TTC will not be able to blame Bombardier and the streetcar system for a shortfall in service on the bus network. As with other modes, the problem with TTC reporting is that stats are aggregated and one cannot pick out the effect of various changes. Vehicle reliability is reported in various ways, and it is not clear whether these are directly comparable for all modes. For the subway, a failure is considered to have occurred if it delays service for 5 minutes or more. This is an international standard the TTC uses to benchmark itself against other systems. A similar standard is applied to streetcars. It is unclear just what a failure that delays service (other than by creating a gap) would look like on the bus network given that vehicles can pass each other and do not accumulate as they do for rail modes. Recently, the TTC has also been reporting surface Road Calls and Change Offs (RCCO) which count the incidents where a repair truck must be dispatched (Road Call) or a vehicle Changed Off for a replacement. Note that a Change Off may occur for a vehicle that is operational (and therefore not creating a delay), but has a problem requiring it to be pulled from service. When comparing modes, it is important to remember that some types of failure have nothing to do with the distance a vehicle travels, but rather on the duty cycle measured in time. For example, a common failure is in door subsystems, and this is driven by how many times they open and close, not by how far they travel. Failure rates per kilometre are lowest on the subway and highest on streetcars even if the basic reliability is the same because the average operating speeds of the routes they serve is so different. Another issue with subway trains is that it is possible for one car to fail without causing the entire train to block service. This reduces minor incidents to a level where they could fall below the five-minute delay threshold. Finally, the reliability numbers can be affected by the relative size of the spare fleets. When there are many spares, preventative maintenance is more likely to be completed, and “problem” vehicles can stay in the shop. When there are few spares, bad vehicles are pushed out the door (thereby keeping up schedule service rates) only to fail in service. This has been a problem with the older streetcar and bus fleets. By contrast, the TTC has a considerable stock of surplus subway trains. 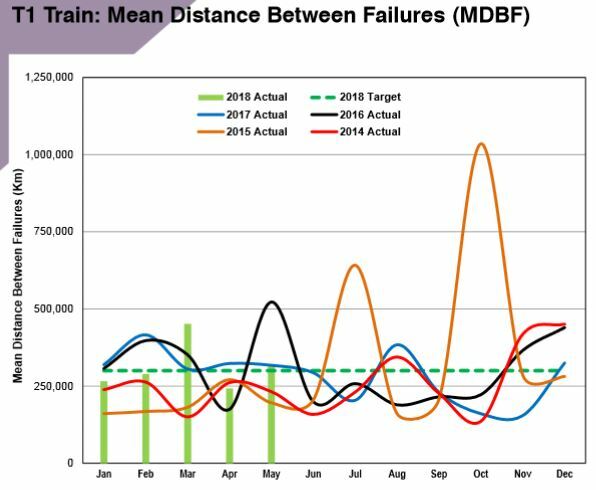 Reliability numbers on the TR trains bounce around quite a bit because the actual number of failures is small each month. It does not take much of a change to produce a big swing in the MDBF value. 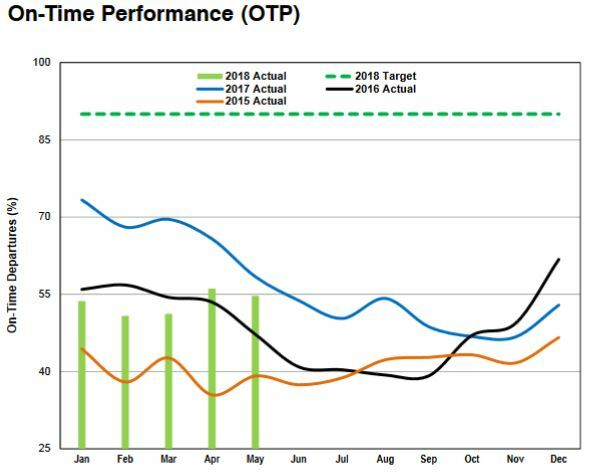 During 2017, Andy Byford often touted the high values reached by the TR trains, notably in May, September and November. However, these have not been sustained, and 2018 numbers have settled into the same pattern seen in past years. In other words, some of these failures are for relatively simple parts of the train, but they caused a “failure” to be recorded against the fleet. This shows the importance of reporting the details, not just the aggregate numbers. … Equipment Control Desk and Transit Control are working towards ensuring that the incident recovery times are returned to average levels (below the five-minute threshold). In other words, getting something fixed quickly enough that it does not count to the MDBF statistics is an important goal. While quick response to problems is desirable, the sense of “managing to the metric” here cannot be avoided. There were nine delays in May from a variety of factors including Brake Systems (3), HVAC (Heating, Ventillation and Air Conditioning) caused by faulty remperature sensors (2), Door Systems (2), Body (1) and Trainline Systems (1). Various programs are underway or have recently completed to eliminate sources of failure. Note that this fleet is about half-way through its design life, and it is not uncommon for problems to crop up as trains age. The reliability of the oldest streetcars, the CLRVs (single section cars) has been dropping due to their age and effects of the winter weather. However, there is something of a rebound, relatively speaking, because the worst of these cars is no longer in service. As of June 2018, 71 of the original 196 cars have been retired. 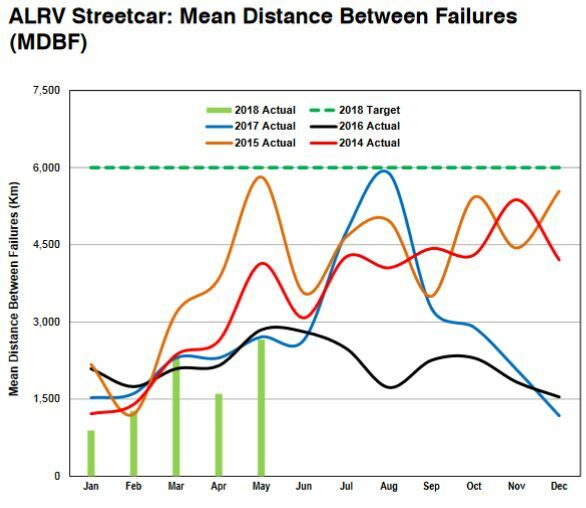 The ALRVs (two section cars) have never been as reliable as the CLRVs, and they are tracking at least 25% worse than cars that are actually older. Of the original 52 cars, 23 have been retired and we are likely to see more of them disappear as soon as they can be replaced by new Flexitys. The Low Floor LRVs (Flexitys) are running ahead of 2017 results well above the level of the older fleets, but still not at the target of 35,000 km between defects. The availability of this fleet will be slightly reduced by a welding repair program at Bombardier that will require cars to cycle to and from the shops at La Pocatière in Québec. 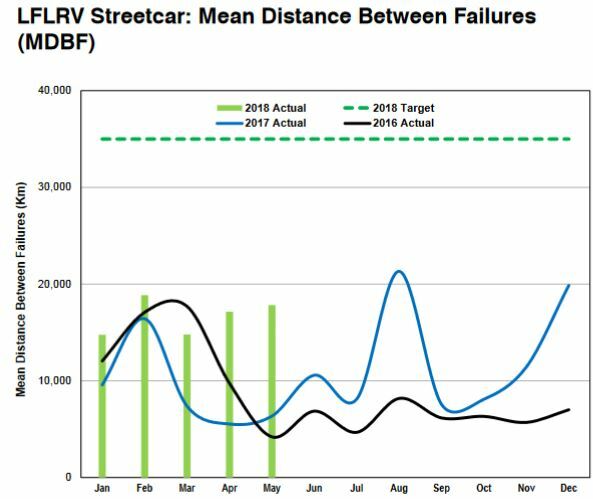 However, the expected increase in the delivery rate in 4Q18 should accelerate the replacement of old streetcars and, eventually, a return to full streetcar operation on the network. 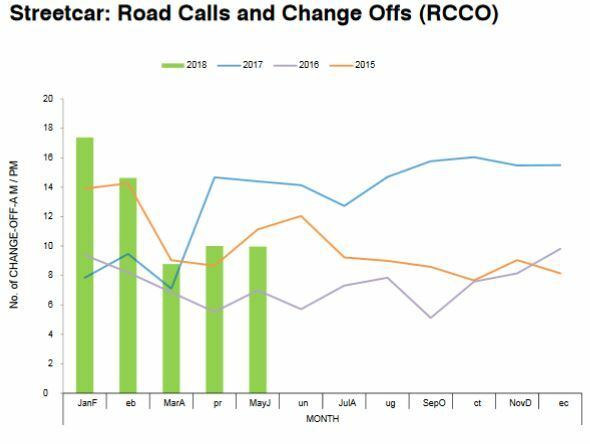 The rate of Road Calls and Change Offs (RCCO) improved in 2018 over 2017, although this is likely due most to the reduction in streetcar retirements starting in mid-February and the retirement of the worst of the old fleet. 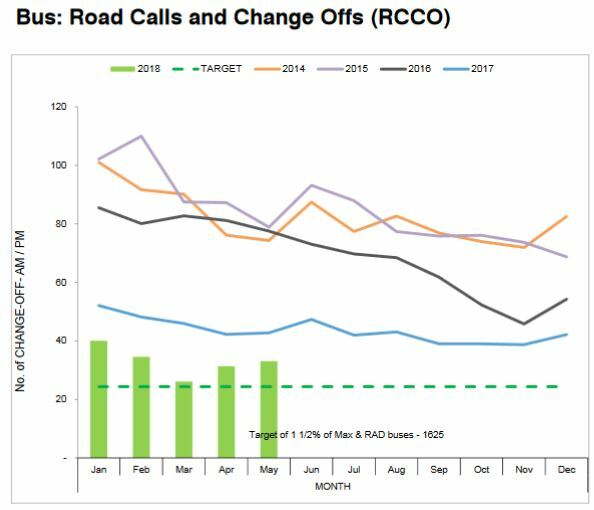 2017 was a particularly bad year and one cannot help wondering whether the stats reflect a decline in pro-active maintenance of cars that were scheduled for replacement, but had to be kept running thanks to slow Flexity deliveries. Although the RCCO target is 1.5% of peak service, the number actually achieved was 5.5% or 8.7 vehicles. This is not broken down by vehicle type and so we cannot see how the changing mix of the fleet with deliveries and retirements could be affecting the stats. 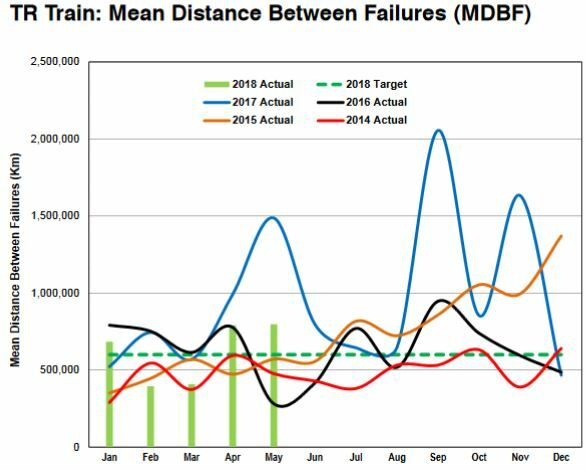 Bus MDBF numbers have steadily increased from 2014 to date thanks to a change in maintenance practices (“fix before fail”) so that regular inspections occur more often than the typical failure rate. This may seem like an obvious tactic, but cutbacks in inspection frequency were a direct result of budget cuts in past years. The other big change is that in recent years the problem fleets have been retired, and the TTC no longer attempts to keep buses running for 18 years. This substantially lowers the average age of the fleet which, with the large recent purchases of new vehicles, is unusually low. This has a downside about ten years in the future when the average age will be much higher, but not as severe as if the TTC had planned to keep this new fleet to its 18th birthday. Mirroring the improvement in reliability, the RCCO numbers for 2018 are at the lowest level. The target is to have no more than 1.5% of peak vehicles requiring a peak period change-off. 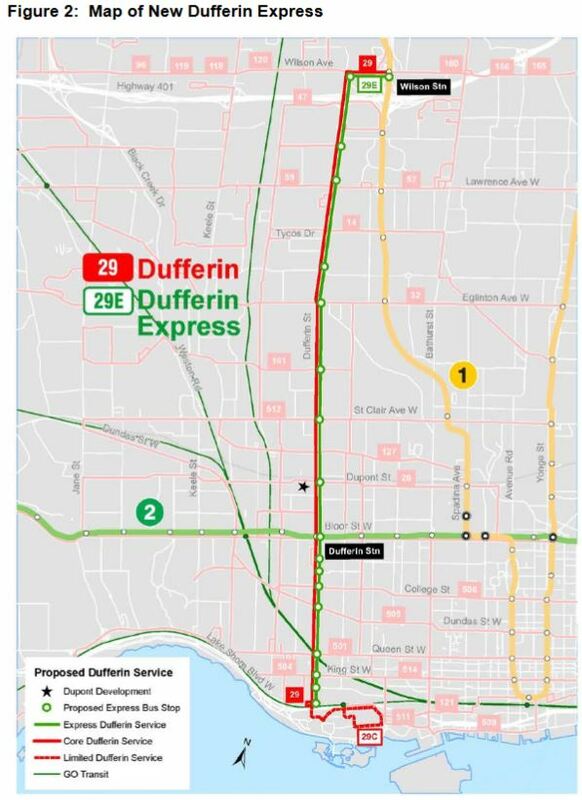 TTC plans for Dufferin Street include the implementation of an express service (October 2018) and a switch to articulated buses on Sundays (September 2018). Also in the works are transit priority measures to speed up service, but the details have not yet been announced. Dufferin Street has already seen growth in population and jobs, but much more is expected in coming decades. Figures in the table below use a fairly granular view of development zones, and some of the growth projected here lies some distance from Dufferin Street itself. The new express service will operate through the day and early evening on weekdays, and through the daytime on weekends. It is expected to add ten percent to the route’s capacity with daily usage by 14,200 trips. When the TTC last reported route-level ridership in 2014, the total daily usage was 44,000, and this number has probably grown in the intervening four years. With the onset of express operations, the 29B Tycos Drive peak period short turn will be discontinued. The TTC argues that the stops on this loop are used by only 220 rides per day while there is much greater demand north to Wilson Station that will benefit from full service. With the potential growth in this corridor, there is a question of just how much the Dufferin bus, even with improvements, can handle. During the peak periods on weekdays, the combined service on the Dufferin Street corridor will be scheduled to operate every four to five minutes with the capacity improvements to be implemented in October 2018. This is an intriguing statement in that the TTC effectively says that they prefer to avoid a service frequency below three minutes. This is not surprising given delays at stops and the interaction of buses with overall traffic flows and signal timings. The only change that will be implemented immediately is the extension of the 80 Queensway bus to Keele Station via Parkside Drive during all operating hours. During the reconstruction at Humber Loop, all service ran to Keele Station, and it was only recently that the late evening Sunday/Holiday service terminus moved back to Humber Loop. This will leave only the 66 Prince Edward bus as a connection at Humber to the 501 Queen service, a remnant of the days when this was also the fare boundary with Zone 2. 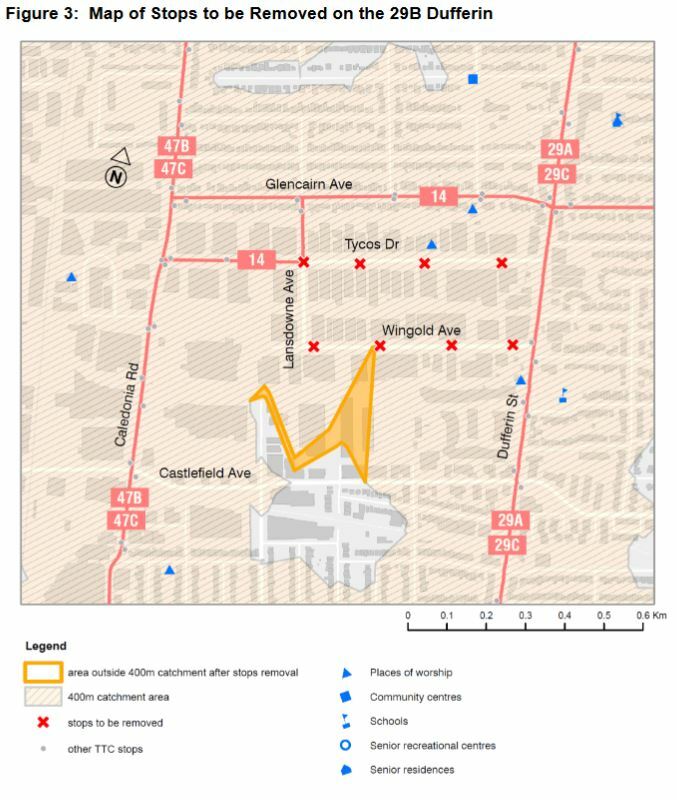 Among the issues the study is to address are the discontinuous nature of transit services on St. Clair (Weston Road to Scarlett Road) and on Dundas (Dundas West to Kipling). Another concern is service frequency which combines with forced transfers for trips that do not follow existing routes to make for difficult journeys. 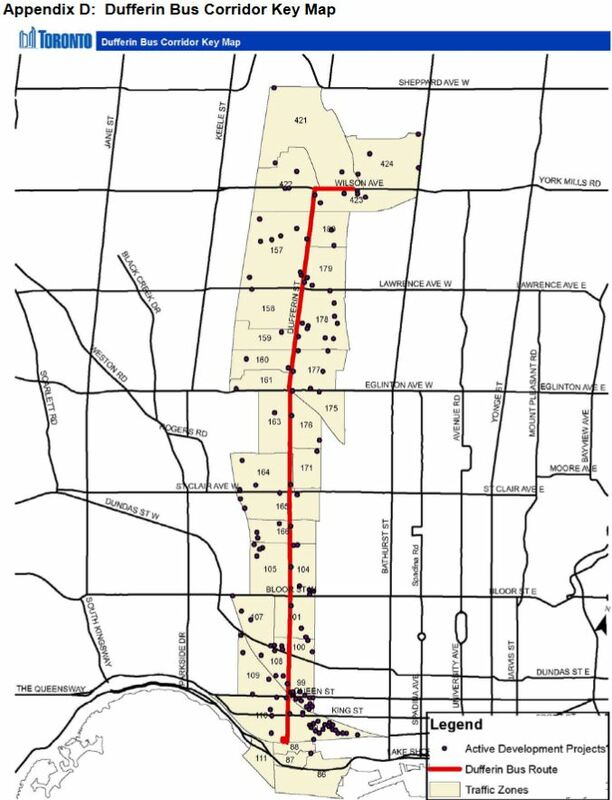 The proposed service levels on Dundas Street are comparable to those now provided by the 40 Junction and 30 Lambton routes, although the more frequent service now offered east of Runnymede Loop would be extended west to Jane Street. The major difference would be that 40 Junction would run all the way to Kipling Station, while 30 Lambton would be reduced to a shuttle between High Park Station and Runnymede Loop (thereby making its existing route name obsolete because it would no longer serve its namesake neighbourhood). Up at St. Clair, the situation is more complex with a tangle of existing routes and the physical limitation of the streetcar network ending at Gunn’s Loop. It is doubtful that this will ever be extended because the Jane LRT that was proposed in Transit City has fallen off any credible planning map due to physical constraints on Jane itself and tepid political support. The TTC proposes to extend the 127 Davenport bus west from its current terminus at Townsley Loop (St. Clair and Old Weston Road) to Scarlett Road replacing the service now provided on St. Clair by branches of 71 Runnymede and 79 Scarlett Road. Consolidation of services on those routes would improve frequencies in locations where there are now split operations. The whole design is based on a zero-sum approach in which existing buses and bus hours are redistributed among routes. Route changes in this area are also subject to disruption in the medium future thanks to planned reconstruction of the rail bridges at Scarlett Road, St. Clair and Dundas, as well as east of Keele and St. Clair. Feedback from riders in the affected area has been positive for the Dundas Street proposals, but not so for the scheme on St. Clair. This is an example of how transit use is affected by route design and settles into a pattern based on where the buses go “today”. A change to a through service on St. Clair may look good on a map, but it might not actually serve the travel patterns that have developed around the existing routes. The study will continue to the end of 2018 with an updated proposal coming to the TTC Board in 2019 and implementation, as usual, subject to funding. This report updates the status of various RGS initiatives. Some of these are already in place, but more are to come. Some are small-scale tweaks while others involve major changes. Of particular concern is that changes which should be made in the course normal upgrades to meet rising demand are presented as part of a “growth strategy”. Such is the political straight jacket in which the TTC operates that changes are implemented through special funding. A related problem, as I discussed in a previous article, is that the system is fleet-constrained on all modes. 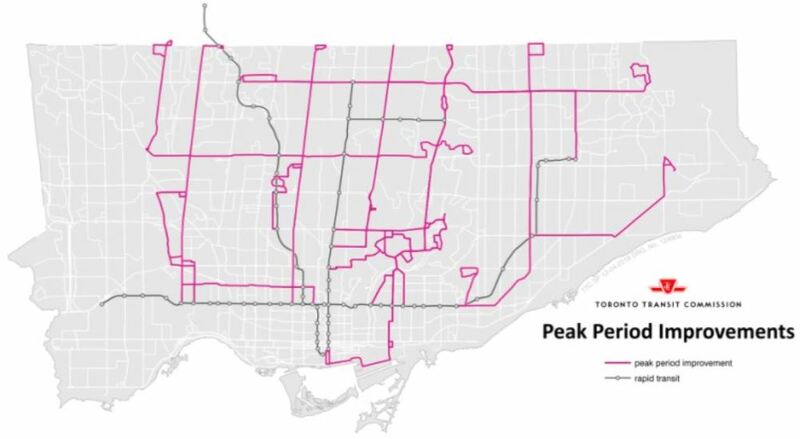 What the TTC does not have is a true strategy to explain what could be possible and with what benefit if only the funding, fleet and surface network priority were available to operate it. Line 1 Yonge-University Spadina: In September, a third “gap train” will be added to the schedule for service relief, and the morning build-up of service from Wilson Yard will use the new north exit track connection to reduce congestion at the south yard entrance. A fundamental design problem at Wilson (as with any large carhouse or garage) is that many vehicles/trains have to get into service in a fairly short period to “load” the system with capacity for the AM peak. In the subway at Wilson, this is further complicated by work trains returning to the yard after overnight maintenance work. Transit Surface Priority: Three “queue jump lanes” for critical points on the bus network will be tendered for construction, and signal priority will be improved or updated at six intersections. None of the locations is specified, and six TSP locations is hardly a massive addition across the city. New Express Services: The Express Bus Plan will begin to roll out with peak period express operations on seven routes. Off-peak express service will also be provided on Dufferin and on Markham Road. Stop Upgrades/Relocations: At least 300 stops will be upgraded for accessibility and/or to accommodate articulated buses. The City of Toronto plans to install about 400 new shelters. 65 streetcar and bus stops will be moved for safety or reliability. Two-Hour Transfers: The two-hour transfer rule will be implemented for Presto single-fare riders at the end of August 2018. GO/TTC Discount: Presto single-fare adult riders now receive a $1.50 discount on their TTC fare when transferring to or from GO. This program is funded to March 2020 by Ontario, but its status thereafter, as well as that of other fare integration discounts that were part of the Liberal pre-election budget, remains to be seen. Fair Pass Discount: Reduced fares are available to Ontario Disability Support Program (ODSP) and Ontario Works (OW) recipients who live in the City of Toronto. The discount reduces their fares to senior/student levels for single fares and for passes. Note that for someone who already qualifies for this discount, there is no further reduction. 6,000 Presto cards have been issued of which 2,198 were used as of May 10, 2018. A total of 30,275 “taps” have been recorded (excluding transfers) of which three-quarters were on the surface network, primarily buses. There is no route-by-route breakdown of usage, but this would be informative in showing where low-income riders and their travel demand are concentrated. U-Pass: The TTC Board approved offering a pass to Post Secondary students at a 40% discount off of adult pricing with the proviso that 100% of an institution’s students must buy the pass. Although there has been strong support from student groups for this pass, it failed to win approval in a referendum at the University of Toronto. A vote by Ryerson University students is planned for fall 2018. The basic problem with the 100% sale requirement is that it requires students who do not use the TTC (a larger proportion at the suburban campuses) to, in effect, subsidize cheaper TTC travel by students who do. A related political issue is that it is hard to justify a deeper discount to university students than to the poor under the Fair Pass program unless students as a group subsidize each other. Bike Infrastructure: The TTC will improve bike facilities at many of its rapid transit stations. This work is funded by the Federal government (PTIF) and the City of Toronto. Beacon Wayfinding: A pilot is underway at St. Clair Station and the surrounding area of a wayfinding app for the visually impaired. Though I realise that TTC ‘policies’ are applied in a seemingly random (or self-serving?) way! I was wondering when we might see the (I think ‘mandatory’) review of the “new” 121 bus route. (Now just over 2 years old.) This route IS certainly useful and it is good that it has been extended to Ontario Place at least in summer but its utility is greatly reduced because it has absolutely NO stops between east of Bay and west of Simcoe – i.e. in front of Union Station (where it would link to VIA, GO and TTC subway). Due to ridership being lower than they expected the frequency was recently reduced slightly. The City have been studying traffic patterns around Union with the hope traffic on Front can move a bit faster and that stops can be installed. Any idea when (if?) we may see a proper evaluative study that might suggest improvements (extension through Canary District to Corktown Common and to Ontario Place all year?) and better stop locations and timings? Steve: By “to Corktown Common” do you mean to Cherry or some place further east? The “winter” route is supposed to go to Mill and Cherry, although it was diverted for construction for a time if I recall. I will be reviewing operation of various routes serving the waterfront probably in August when enough summer data will have accumulated. My suggestion for the 121 was to look at continuing it eastwards of Cherry Street along Front Street to Bayview and swing round to Mill to return westwards – to serve the growing population east of Cherry. Currently, the 121 turns south on Cherry and then west on Mill (except when it continues to Sugar Beach). Looking forward to your review and hope the TTC may actually take advantage of your analyses. When looking at ‘waterfront routes’ you might want to keep the 65 Parliament in mind, there has been talk of extending it south on Parliament to Queen’s Quay rather than having it turn back at Front and Princess. Steve: I have not been pulling data for 65 Parliament, but will be looking at 75 Sherbourne, 72 Pape, 121 Fort York, 6 Bay and of course 509 Harbourfront. Preliminary looks at both Bay ad Sherbourne show chronic problems with operators running in packs. It’s not congestion, it’s “TTC culture”. The Junction Area study has been ongoing for more than a year and although it was to encompass far more than 40 Junction little has been put forward beyond Dundas and St.Clair streets. What has been put forward has ZERO improvement to service frequency and transfers between routes. In fact the proposals will degrade the service by eliminating 79B Scarlett Rd. a direct connect to/from the 40 Junction and the Runnymede Subway station. Turning 40 Junction into two branches will mess up a service that is near perfect creating two headways and a difficult transfer at Runnymede eliminating a shelter and walk of a few feet to crossing two busy streets. It will be a guessing game as to which branch will arrive first. Running time for 71A Runnymede to/from Gunns Loops is inadequate and unreliable – replacing it by extending Davenport route will improve nothing. It will reduce service on Runnymede as will eliminating 79B. 30 Lambton cut back to run only from High Park Subway station to Runnymede Loop will be of little use to anyone. All in all, not very impressive “planning” after many months. Steve: What is particularly striking is the effect of preserving the total number of vehicles used and roughly the existing headways. It’s no wonder that they got pushback on everything but the 80 Queensway full day service to Keele Station which they had already been running for over a year anyhow. The problem with trying to keep an even spacing of vehicles on a short headway route is the incompatibility of the headways with the signal timing. Let’s use, for an example, a signal cycle time of every 2 minutes. This forces the spacing between the vehicles to be 0 or a multiple of 2. For a bus on a 15 minute headway the fact that they are actually on a 14 – 16 – 14 – 16 spacing is not a real problem. If, however, they are on a 3 minute headway then problems start. Even if you have a dispatch system that sends the vehicles out of the terminal on a 3 minute headway the first traffic signal will destroy this. If the first bus gets through, then the second bus will get held and the third bus will get through. This quickly sends the every 3 minute service to a 2 – 4 – 2 – 4 service. This means that the bus on the 4 minute gap gets twice as many passengers as the bus on the 2 minute gap on average. After a few more lights it will probably miss one because of the slowness of loading and the spacing now becomes a 2 bus convoy every 6 minutes. The longer the route is the more of a problem it would become. This probably is why most European LRT lines operate with multiple car trains on a 5 minute or better headway. The service may not be as frequent but it is more reliable. I believe that sides of road rights of way are inherently a problem and this has been demonstrated in most areas where they have been used as vehicle making a right turn (left in some countries) are not expecting another vehicle to be on their right and going the same direction. The accident rate at intersections with side of road rights of way are significantly higher. Just google you tube accidents to see many examples of these where ever they have been used. Brampton, and I believe Mississauga, use red lane markings on parts of roads that are only for buses. These are not painted on but are a coating that is heat applied to the regular road surface. The suburbanites in Peel seem to be able to figure out that cars are not supposed to use them. Supposedly the good burgers of the 416 could figure it out if the city and the TTC would only try it. It will be interesting to see in your next update of the King Street Pilot if there is a chenge due to the watermain construction on Adelaide which has cut it down to one lane east of Church. My personal observatoin is that the number of flagrant violations of the King Street Pilot has balooned, including now many more illegal left turns. I would not be surprised if more than one thousand vehicles a day are ignoring the signage in the area. Taxi drivers seem to have a group chat or messaging service now that advises them when police are or are not present on King to hand out fines. Side of road RoW: plenty of these in Germany working just fine. But then in Germany there is actually a driver testing system worth a damn. They even yield to pedestrians. Despite the theoretical twenty-plus ALRVs that haven’t been retired, in practice no more than six or seven are out at a time, and lately it’s been more like five or six. They are always the same ones, too. So in reality, there are less than ten ALRVs in service. As I write this there are only four, which is a new low for midday. For some reason, usually one of the ARLVs is on Lake Shore going back and forth between Long Branch and Humber. Not sure why they’re sent out there, as the capacity isn’t really needed. Shifting overtime work to new employees at straight time will incur some additional benefits and training costs. However, training is a one-time cost. And the benefits must be pretty darn good if they come to more than the additional 50% (or more!) pay rate for overtime. Also, some of the most expensive benefits are a percentage of pay, including overtime pay. These include vacation pay and the employer’s contribution to EI and CPP. Those should drop when overtime is converted to straight time. New employees also tend to be younger and therefore incur less benefits costs. Sometimes people will argue that more employees requires more supervisors. However, people working overtime also require supervision. So that is one of those “Yes, Minister” type arguments that falls flat upon examination. Steve: There is a balancing act here. If new employees hired to offset overtime do not themselves work a full 40-hour week, then the effective hourly cost of the service they provide can be higher than simple arithmetic might imply. Vacation pay and some other benefits such as insurance are a “per employee” cost, not “per hour”, and so the marginal cost of overtime is lower than the bonus rate on pay hours, albeit not 50%. Supervision costs for transit service are related to the number of vehicles in operation, and have nothing to do with the rate of pay for whoever is driving. Training costs do have a recurring albeit small component because operators have refresher/recertification courses every few years. Not only must they be paid for the time spent on this training, the crews they would otherwise be driving must be covered too. 3. “Better to keep this spare change ‘under the mattress. '” Again, in the private sector it is an accounting no-no to keep an unreported slush fund lying around. No kidding! What genius thought that it would be possible to keep track of subway passengers who had not paid the TTC fare and compel them to get off at York U and prevent them from going downtown? Steve: Simple. A York Region rider would tap on the bus portion of their journey on a YRT/Viva vehicle. For the subway portion of their journey, they would tap in and out. If their journey was within the area between York University and Vaughan stations, it would not attract an extra fare, and there would be an accounting of the “free” subway rides provided in this manner for purposes of calculating any special subsidy. It is the tap out that would trigger the free travel inbound. Outbound, Presto will “know” who boarded at York U Station or anywhere further north, and the tap on to a YRT vehicle would trigger the co-fare discount. Kevin’s comment: Fascinating! In effect, Presto enables the creation of special fare zones. I did not know that. This is almost too much flexibility. My crystal ball says that as soon as politicians also learn about this capability, some of them will start to press for special fare zones that benefit various groups. With, of course, arguments about why they “deserve” these special fare zones. Steve: This arrangement was talked about quite some time ago as part of the fare scheme for the TYSSE, but it was never implemented. The Ontario Employment Standards Act dictates that vacation pay is a percentage of gross pay, with the minimum set at 4%. Although I have not read the TTC Collective Agreement, I would be very surprised if anything above 4% were not also set as a percentage of gross pay. Steve: Employees receive vacation as weeks off depending on seniority, not as a cash payment. If you’re entitled to three weeks, you get three weeks no matter how much overtime you work. The cost of replacing an operator for their time off is not affected. The point I was trying to make is that a lot of the most expensive benefits are a percentage of gross pay. And therefore hiring new employees rather than working overtime results in a reduction of these benefits payments. Steve: Actually, the biggest gross pay related cost is the pension. Vacations are not affected by overtime as I explained above. Health care benefits (supplementary insurance) are per employee and are also related to actual usage. There has been quite a drop recently in this cost due to the reduction in benefits fraud. Under recent legislation, employees are entitled to emergency leave days. Again, this is a per employee cost and also depends on utilization, but not on overtime.